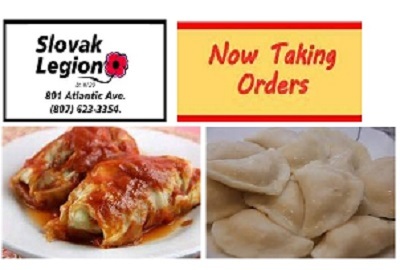 Easter Cabbage Roll and Perogie Orders are being taken by The Slovak Legion Branch 129. Perfect for Easter Celebrations or just great food to share. Phone 623-3354 Ext. 1 or 2 Monday to Friday between 9:00 a.m. and 4:00 p.m to place orders until Friday April 12, 2019 with pick up on Thursday April 18, 2019. Pick up at the Slovak Legion at 801 Atlantic Avenue…just over the Bridge.